Budd, a name he adopted, was born Leland Buster in Colorado (probably near Colorado Springs) June 14, 1891 (some references list 1892 but in Budd’s own handwriting he listed 1891 on his 1917 WWI draft registration card.) His parents were John M. Buster and Anna (Annie) Moore Buster, both from Missouri. By the 1900 census the family, including Leland’s younger (by one year) sister, Demple, and his grandmother on his father’s side, was living in Colorado Springs. By 1920 Leland/Budd was married to Mary with two children, Mary Jane (4) and John (1), and was employed as a driver at a livery house in Ivywild, CO.
At some point it’s believed Budd got into vaudeville which led to film work by 1933, as one of his greatest talents was his ability to apply makeup, giving him wide latitude in portraying various characters. That expertise allowed him to play multiple roles in several films. 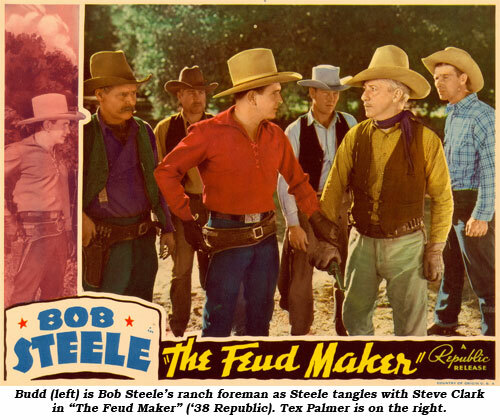 In Bob Steele’s “Cavalry” (‘36 Republic) Budd had the titular role of Steele’s wagon boss sidekick as well as Abraham Lincoln in silhouette. In Montie Montana’s “Circle of Death” (‘35 Kent) Budd is a wagon train scout and a storekeeper. He’s a trading post operator as well as a waiter in the barroom in Bill Cody’s “Six Gun Justice” (‘35 Spectrum). 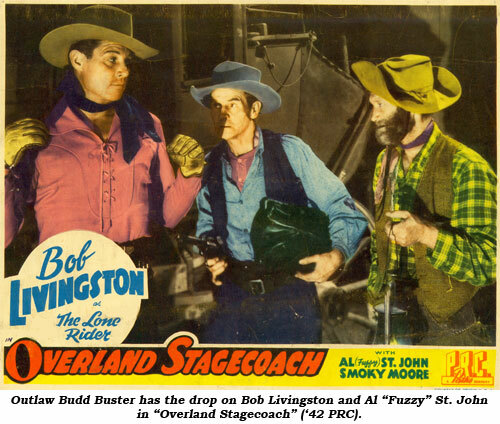 For Hoot Gibson’s “Cavalcade of the West” (‘36 Diversion) Budd is a stage guard and an Indian. 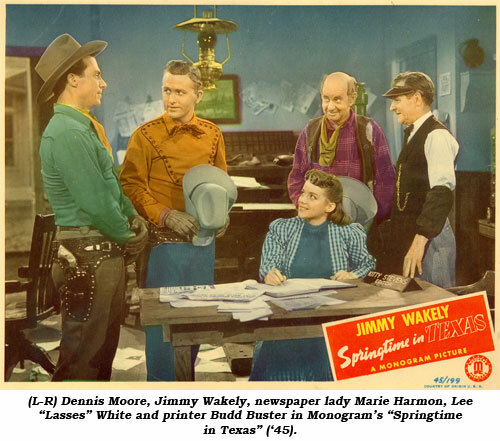 He was a rustler and a townsman in “Between Men” with Johnny Mack Brown (‘35 Supreme). This chameleonic ability also kept Budd in demand by national ad agencies who used him on national billboards for Studebaker, Eastside Beer and others. Studio-wise, Budd was everywhere, but PRC and Monogram might have gone out of business if not for Budd’s participation. As stated, Budd did it all. We’d have to devote an entire issue to Budd in order to cover all his roles. 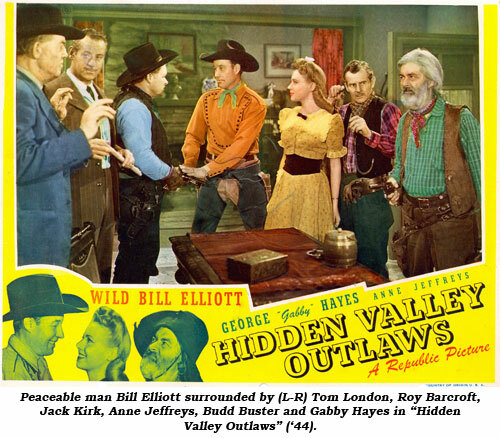 As for badmen, see him at his nefarious best in “Colorado Kid” (‘37 Republic) w/Bob Steele, a bank robber in “Desert Justice” (‘36 Atlantic) w/Jack Perrin, a rustler in “Silent Valley” (‘35 Reliable) w/Tom Tyler, “Texas Marshal” (‘41 PRC) w/Tim McCoy, “Billy the Kid Trapped” (‘42 PRC) w/Buster Crabbe, “Man’s Country” (‘38 Monogram) w/Jack Randall, “Overland Stagecoach” (‘42 PRC) w/Bob Livingston, a Nazi saboteur in “Cowboy Commandoes” (’43 Monogram) w/Range Busters, an underhanded foreman in “Brand of the Devil” (‘44 PRC) w/Dave O’Brien/Jim Newill, a crooked postmaster in “Border Badmen” (‘45 PRC) w/Buster Crabbe and, best of all, as a crazy old coot in a haunted mine in “Wild Horse Phantom” (‘44 PRC) w/Buster Crabbe. 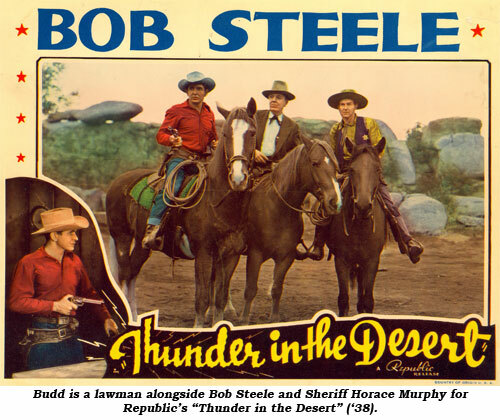 Pick out a few of those for your Budd Buster film festival, then see him as a comedy relief ranch hand in “Desert Patrol” (‘38 Republic) w/Bob Steele, a Mexican named Tequila in “Under Strange Flags” (‘37 Crescent) w/Tom Keene, a ghost town storekeeper in “Vanishing Riders” (‘35 Spectrum) w/Bill Cody, an Indian in “North of Arizona” (‘35 Reliable) w/Jack Perrin, a dopey deputy for “Thunder In the Desert” (‘38 Supreme) w/Bob Steele, a tetched in the head old timer still fighting the Civil War in “Guns of the Law” (‘44 PRC) w/Dave O’Brien/Jim Newill and a hot headed old uncle w/Jimmy Wakely in “Rainbow Over the Rockies” (‘47 Monogram). 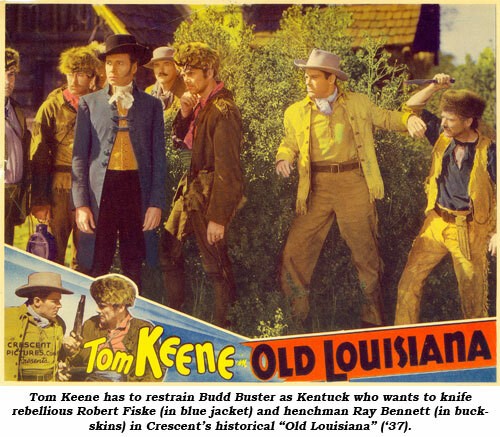 Budd was even a bonafide sidekick to Jack Randall in Monogram’s “Covered Wagon Trails” (‘40), Crescent’s “Drums of Destiny” (‘37) w/Tom Keene and “Feud of the Range” (‘39 Metropolitan) w/Bob Steele. But perhaps the best role of Budd’s illustrious career was in “Trail of Terror” (‘43 PRC) w/Dave O’Brien and James Newill as the interested “protector” of saloon lady Patricia Knox much like Richard Barthelmess was for Marlene Dietrich a year earlier in “The Spoilers”. 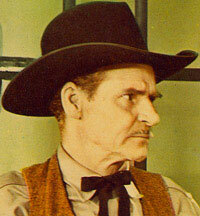 And we mustn’t overlook the 17 serials in which Budd appeared. Most were small character parts with more prominent roles in “King of the Royal Mounted” (‘40 Republic) as trusty Vinegar Smith, “Jungle Queen” (‘45 Universal) as Frank-Buck-like Jungle Jack, and “Jungle Raiders” (‘45 Columbia) as Dr. Murray Reed, held prisoner in the Arzec jungle. 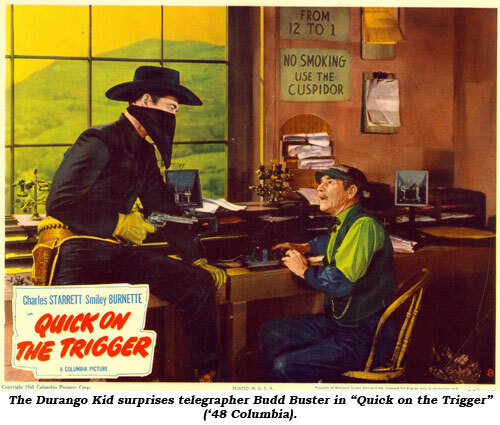 Interesting to note Budd’s 27 year old son, John L. Buster, got into the act in two mid-‘40’s Buster Crabbe Westerns at PRC—he even sings in “Prairie Badmen” (‘46). It’s imperative we point out that character player George Selk (1893-1967), while bearing a slight passing resemblance to Budd, is not Budd using an alias nor is he in any way related. 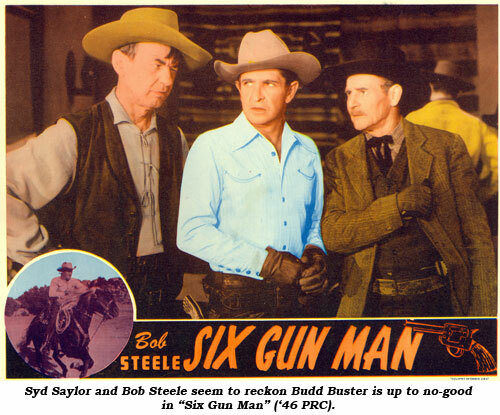 Selk was in films from ‘53-‘66 and is best noted for playing stableman Moss Grimmick on “Gunsmoke” in the ‘60s. 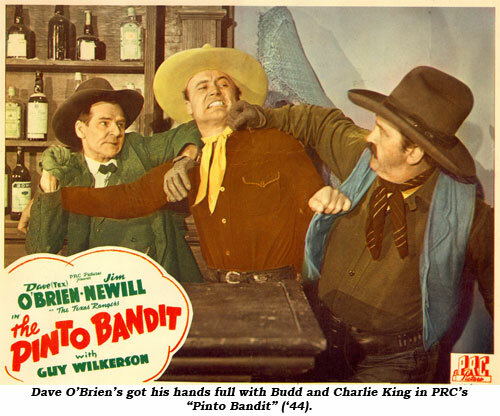 Budd barely ventured into TV, but two of his last roles were on “Buffalo Bill Jr.: Black Ghost” (‘55) and “Gene Autry: Outlaw Warning” (‘54).